New Sardine Pouches Coming to Wal-Mart Soon! Keep your eyes peeled for our brand new product – pouch-packed sardines! They’ll be arriving on Wal-Mart shelves before the month is out, and we couldn’t be more excited about it. Packed with protein and omega-3s, these sardines are great for snacking on the go, at work, or as nutrient-rich sustenance while camping or hiking. 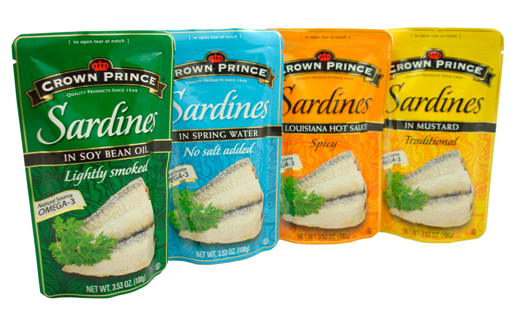 Stay tuned both here and on Facebook – we’ll make an announcement when Crown Prince sardine pouches are officially available at Wal-Mart. This product is NOT recommended. I find many scales in the package, and the package itself is half filled with sauce so that there is MUCH less actual sardine flesh than typical cans. You are wrong! Crown Prince sardines in a pouch are the BEST EVER! They are the only sardines I eat because all other brands gross me out and make me gag!! It’s hard to choke them down and get nutrition i need that way!! Hello, I LOVE Crown Prince sardines!! I especially love the pouch, as it is easy to pack for work and easy and fast to open it, i only have 24 minutes for lunch!! Plus, they give me the strength and energy I need to work 10+ hours a day in a physically demanding job. I am female, over 50, and keep up with or am faster than 20 year old guys.Your sardines WERE just the ticket for me.Also, at under a dollar a pouch, they fit into my meager food budget. However, the Walmart near me STOPPED stocking them!!! I even asked them if about this and they doubted they were getting this product back. I’ve tried to replace them with other brands of sardines but they all come in cans which are a hassle to open and sardines in a can just look gross to me!!!! Could you help me out? Thank you for being a loyal customer. Unfortunately, the sardine pouch products were discontinued about a year ago. At this time we do not have any plans to sell sardines in the pouch again. We appreciate your continued patronage.